How do you describe the Azores Islands? The Azores Islands are best described in one word: magical. They are not magical in the sense of the Magic Kingdom of Walt Disney World! They are thousands of miles away from that hustle and bustle. And they are an entirely different kind of magic. It is the kind of magic that only mother nature can create. Volcanic eruptions over thousands of years have served to create an Archipelago of unique islands in the Atlantic Ocean. These islands remain a largely undiscovered gem in the middle of Atlantic Ocean. They are not over run by tourists and maintain an old world charm. I first discovered the Azores when I was still a teenager in the late 1980's. I traveled there with my father and mother and immediately came to love the unique characteristics of the islands. I have been to the Acores many times and each time I have been amazed by the beauty. So how did I find the Azores? My dad, Joe, immigrated to Canada with his parents, brothers and sisters in 1958. He never returned until the 1980's when he went over with my mom. A few years later I went over for my first trip to the Islands with mom and dad. I was captivated by the view of the Atlantic Ocean from everywhere on the island. I loved the seemingly ancient cobblestone streets, unique buildings with tile roofs, the rugged landscape created by volcanic eruptions (the volcanoes are still active), the copious amount of green vegetation, and the star filled night skies. And I still remember the first time I saw the Calderas in Furnas. Seeing the ground continuously boiling was beyond my belief. It made me a little nervous to tell you the truth! This was the first of many fantastic trips that I took to the Islands. And now I want to share the Azores with you! My extended family now accounts for at least a hundred Acores Vacations. Together we have explored the islands. I am building this website so that we can share our experiences with you. We have climbed the mountainous terrain and hiked on the volcano's craters. We have lounged on the beaches and snorkeled in Ocean. We have explored the villages and towns. We have sampled the wines and tried the restaurants and cafes. Each of us have hundreds, if not thousands of pictures of these magical islands. Pictures of places like this Acores Island lookout in San Miguel. This picture is taken from the rim of one of the volcanic craters on the islands. And yes, that's a village down below. Quite a nice little town with a great hotel, nice park and lots of interesting sites including the calderas I mentioned already. I will be writing about my experiences and inviting my extended family to contribute as well. Please let me keep you up to date on that by subscribing my monthly Magical Azores Islands Newsletter (click here to go to subscription page). PS Get started exploring this site by clicking the articles below or using the Navigation Bar on the left. The Magical Azores News Letter keep you up to date on the Magical Azores Islands website. Get a monthly update on what's new on the site. Discover new spots on the islands. Do you have a comment about the Magical Azores Islands website? Or would you like to share something about the Azores? This is the place to comment or ask questions. 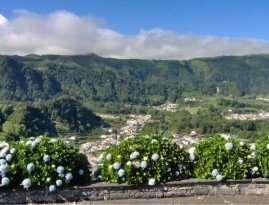 Do you have pictures from the Azores? Share your favourite Azores photos here! 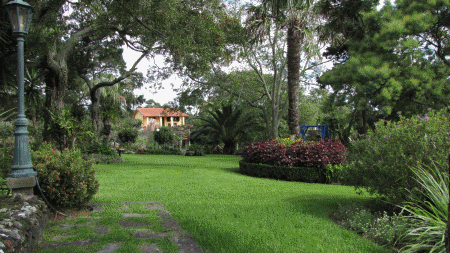 The Azores Climate is quite mild all year round. You will never see snow there unless you climb a mountain. And the summers are nice, but not excessively hot. Use this online azores map to zoom in, zoom out and explore each of the nine Azores Islands. All in one web page! Finding the Azores Location on a map of the Atlantic Ocean. Flights to the Azores. Because the Azores islands are undiscovered (not overrun by tourists), there are limited direct flights. Graciosa Island is the Island of the Calm. You would never know, or guess, that it has a mysterious hot spot that is unique in all of the planet. Would you? The Island of Corvo, Azores, is the most western spot of all of Europe. It is very remote and isolated and a great place to get away from it all. Azores Sailing can be a wonderful experience. You will get a great view of the Island(s), will probably come across whales and dolphins, and will experience a sense of calm. That was my experience! Azores Hiking is a great experience at any time of the year. The trails are set in scenic locations and are at all levels of difficulty. Portugal Azores and Madeira resources and information for areas outside of the Azores. This Pico Azores Map shows the island of Pico.